Predicting is an important reading strategy. It allows students to use information from the text, such as titles, headings, pictures and diagrams to anticipate what will happen in the story (Bailey, 2015). When making predictions, students envision what will come next in the text, based on their prior knowledge. Predicting encourages children to actively think ahead and ask questions. It also allows students to understand the story better, make connections to what they are reading, and interact with the text. Making predictions is also a valuable strategy to improve reading comprehension. Students are able to make predictions about a story, based on what they have already heard, read, or seen. This in turn, will allow students to become actively involved in the reading process. To determine if their predictions are correct, students should be required to reread portions of the text to recall facts about the characters or events within the story. Picture walks can serve as a tool to organize information within a story, which can also increase a child’s comprehension. During a picture walk, students are able to activate their prior knowledge and connect the visual images in the story to their own personal experiences. Students can also use a graphic organizer to predict the outcome of a story. They can do this by identifying clues within the text to predict how characters will behave and how significant problems in the story will be solved. When using a graphic organizer, students are able to stay fully engaged in the story as they capture their thoughts in a logical way. It is important for teachers to encourage children to record clues that either support or deny their predictions. Teachers can also allow students to revise their predictions in order to reflect on the clues that are found within the text. 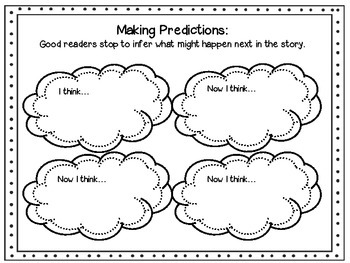 Making predictions encourages readers to use critical thinking and problem solving skills. Readers are given the opportunity to reflect and evaluate the text, thus extracting deeper meaning and comprehension skills. Students will also be more interested in the reading material when they connect their prior knowledge with the new information that is being learned. Review the front and back of a book, the table of contents, the chapter names, subheadings and diagrams prior to reading. There are several activities that teachers can incorporate within their classroom, allowing students to effectively make predictions. To introduce this reading strategy, teachers can hand out photographs from either a newspaper or a magazine. Students will then make a prediction with the evidence from the picture, their prior knowledge, or examples from their own experiences. Teachers can also create a prediction pail. When introducing a new story, students first take a picture walk and then make a prediction based on the title, illustrations, and diagrams. This allows students to use clues and evidence from the text to make accurate predictions. The children then write their predictions on a slip of paper and put them in the pail. Next, students read the story within their small reading groups. After the story is completed, they are able to share their predictions and make connections to the other responses that were shared. Students can make predictions based on patterns. When looking at a problem or example, students will be able to recognize different designs/outlines through repetition and observation. From this information, students will be able to make a prediction with the data that they collected to confirm their answer as they justify their reasoning. Predicting can be used in science when students conduct an experiment. For example, students may be studying a unit on plants and must predict what will happen to a plants growth if the amount of water is increased. Based on their observations and trials, students will be able to predict what will happen next as they gather data and support their answer with evidence.